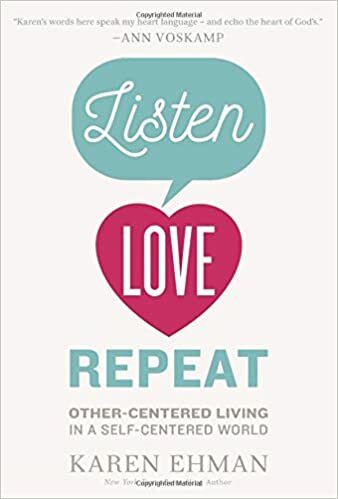 I’m so excited about my friend Karen Ehman’s new book, Listen, Love, Repeat: Other-Centered Living in a Self-Centered World. Karen truly lives out this message in the way she treats her family, friends, co-workers and strangers. She’s warm, considerate and funny…and an amazing cook to boot! Wouldn’t you agree that we live in a culture obsessed with self? Yet with all this focus on “me-first-living,” we are unhappier than ever. This is a welcome book which helps us to live alert, and listen for “heart drops” – hints from those in our lives who might need a helping hand or word of encouragement. In this book (I love the cover! ), you will learn practical and creative ways to scatter kindness, reach out to the lonely, and bless all the “necessary people” who help us get life done everyday. Just leave a comment below to enter to win. And if you don’t have Facebook – way to go! 🙂 Just send an email to [email protected] with “Enter Listen, Love, Repeat” and I’ll put your name in the random drawing.